I had played with checking if site is alive in my AutoIt script and it is harder to implement than it seems. On other hand if there is no need for continuous monitoring – there are quite a few online tools that perform such checks. IsMyBlogWorking is one of those and makes really thorough and detailed alive check. It is single-page and very minimalistic site that prompts for URL to check (there is bookmarklet option as well). After that results are reported, split in two parts. 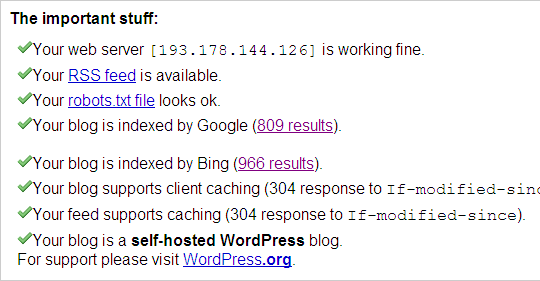 Important stuff covers if blog and its feed are currently responsive and properly indexed in Google and Bing. Boring technical details offer some insight into how fast blog content is served and how compression (if any) performs. Not a specialized site timer, but still nice. steadily developed, I see new features being added from time to time. You are welcome. :) Nowadays you don’t have to be proficient web-master to run site or blog so such tools help to catch and improve tech details. Does it tell you that in California, your blogs are not updated all weekend – or, as far as I can tell, on Mondays? On Tuesday mornings, Saturday’s, Sunday’s and Monday’s blogs all show up at once. I’ve always wondered if that is by design or something is amiss. Blogs=posts? That confuses me all the time. :) You mean live on site or in feed? I use quite agressive caching, but few days backlog sounds like too much. Posts are definitely going live, I am checking for that and validate them as posted as well. So its getting stuck somewhere at your proxy or browser or feed reader/service. Sorry, it confuses me too, and I no doubt used the term incorrectly. In my “post” your Blogs = Interesting and informative articles presented by Rarst. AND, maybe I have the days wrong. I just know that days go by with no new ARTICLES and then one morning there are three new ones. Next could you please try comparing with different browser? Are you (or your provider) using proxy server? Sorry for the long delay, but your post, #11 only showed up this a.m. No new blogs (articles) on either the 12th or the 13th – I took screen shots. Today (08/15/09 at 5:57 a.m.)there are 3 new ones – all at once – for 08/12/09, 08/13/09, and 08/14/09. No proxies. My browser is FireFox. I just looked at your site w/IE and it looks the same, which isn’t surprising, it is Saturday. I will check on both browsers next week. I am going to move to another hosting this weekend (unrelated). :) It just might fix your issues, otherwise I’ll think and get to you on how can it be properly tested. because Rebol is specialized in Networking. Not bad. :) It’s a pity my plate is too ful with programming languages at moment.